2019 NHL Entry Draft Top 31: Is Jack Hughes' position as the projected first overall pick safe? In an era in which teams appear far more inclined to afford younger players the immediate opportunity to develop in the NHL rather than the minors or junior hockey, the attention paid to draft prospects seems to intensify much earlier in the season now. 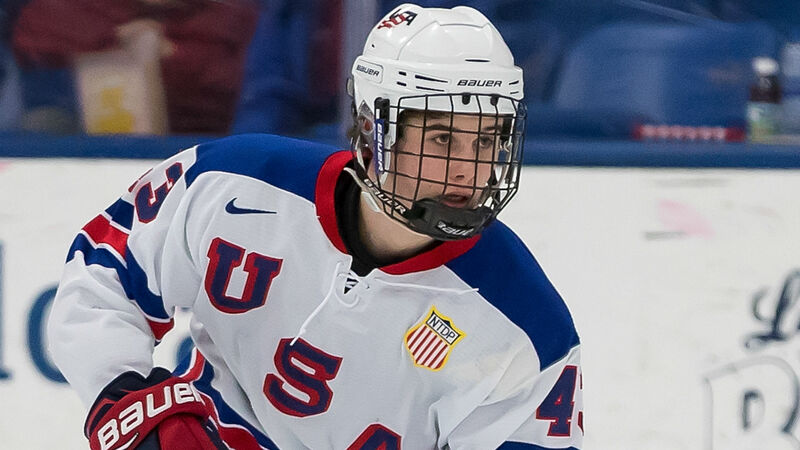 No 2019 draft-eligible hopeful has had the spotlight shine on him for as long as speedy Team USA center Jack Hughes, who some feel is a virtual lock to be the first player selected when the draft convenes in Vancouver in June. But what the last few months have shown us is that it’s time to make a little room on the stage for other prospects, some who even as early as October have distinguished themselves as candidates to challenge Hughes for first overall. Yes, Hughes is a sublime talent with explosiveness and puck skills similar to what Sidney Crosby and Connor McDavid displayed in their respective draft years. And sure, Hughes remains the consensus choice to follow in their footsteps and have the honor of being the first one called at the draft. However, things may start tightening up near the top, as a host of talented forwards from Western Canada and Europe have crept discernably closer towards making this more than a one-horse race. For starters, Russian winger Vasily Podkolzin is everything you want in a player, let alone a draft prospect. The fiery left winger oozes skill, leadership, physicality and elite hockey sense, and his burning desire to be the best player on the ice is matched by his brilliance with the puck. Over in Finland, forward Kaapo Kakko is more than just an awesome sounding name. Kakko is big, strong, quick and versatile while playing a top-line role as either a center or wing with TPS Turku in the elite SM-Liiga. Both Podkolzin and Kakko are playing against adult-age competition, whereas the lighter, leaner Hughes usually matches up against players within his age group. Nonetheless, the electrifying seventeen-year-old Hughes was impressive as he ran through a lengthy gauntlet of topflight NCAA competition. Furthermore, he and his loaded Team USA squad are obliterating the competition at the ongoing Under-18 Five Nations tournament in Kravare, Czech Republic, where Hughes through Saturday has registered a mind-numbing 15 points (six goals, nine assists) in only three games. While both Kakko and Podkolzin have been impressive this weekend against older opponents at the under-20 Four Nations in nearby Hodonin, Hughes’ near-historic performance in Kravare against his draft peers is enough to keep for now the charging competition at bay. The month of November always is a busy one in terms of tracking the progress of draft prospects. There are nearly a half dozen international tournaments taking place, including the annual Canada-Russia Super Series in which each Canadian major junior league ices a U20 lineup of all-stars to play two games with their Russian counterparts. The event is a critical piece in finalizing rosters for the U20 world junior hockey championships, which will begin in Vancouver the day after Christmas. Joining Hughes on the U.S. roster in Central Europe are forwards Trevor Zegras, Matthew Boldy, John Beecher and Cole Caufield, plus two-way defensemen Matthew Helleson, Cam York and Alex Valsic. There is talk that the current installment of the National Team Development Program is the deepest bunch in its history, and as many as 10 players could end up as first-round picks in June. Also, don’t forget about NTDP center Alex Turcotte, who remains one of the top forwards for the 2019 draft but has been limited due to injuries that kept him from participating at the Five Nations. He may only be a teenager, but Podkolzin could have something in common with Alexander Ovechkin and Evgeni Malkin beyond being born in the same country. The 17-year-old winger could become the first player drafted in the top five out of a Russian league since 2004 when Ovechkin and Malkin were the respective top two picks. Podkolzin has a long way to go if he wants to draw additional similarities to the aforementioned future hall of famers, but he is easily the 2019 draft’s most complete player. The only issue is he’s gone on record saying he plans on staying in Russia for a while, which could scare away early-selecting teams looking for an immediate impact player up front. While Podkolzin is otherwise a lock for the first round, Russian junior league linemates Yegor Spiridonov and Pavel Dorofeyev from Stalnye Lisy help form one of the top lines in the MHL and have done enough in a short period to garner serious consideration to go early in the draft. If all three go within the first 31 picks, it will mark the first time since 2004 that at least three players from Russian leagues were taken in the first round. In terms of supplying NHL teams with draft picks, 2018 was an all-time low for the Western Hockey League, which didn’t see one of its players drafted until late in the second round. Take it to the bank — it’s not happening again this year. In fact, a strong case can be made that four of this year’s first 10 picks will come from “The Dub.” Centers Peyton Krebs, Kirby Dach and Dylan Cozens are throwback players who combine effort and heart with skill and speed. Although it’s a thin year for elite defense prospects, Vancouver Giants rearguard Bowen Byram’s leadership, decisive two-way play and nasty streak are reminiscent of a young Chris Pronger. Lastly, Victoria Grizzlies’ playmaking center Alex Newhook is one of the top players in the BCHL and will head to Boston College next fall. #U18: Jack Hughes is putting on a clinic. Here he completes the hat trick with a phenomenal individual effort. Team USA busts it open to take a 4-1 lead. A multi-tool force who plays nasty but also can beat you with ridiculous puck skills, Podkolzin’s desire to develop in Russia shouldn’t trump his game-breaking upside. The top draft prospect from Finland is a low-maintenance playmaker who uses his size to his advantage. Newhook, who is headed to Boston College, is lighting up the BCHL since late September to a tune of almost two points per game. The injury bug may have temporarily slowed down the hype train, but Turcotte is an explosive two-way center who can carry any linemate. Cerebral, Jonathan Toews-type pivot who can beat you with his vision and is a tireless worker in all three zones. Sublime playmaker with elite passing skills and deceptive tight-quarter quickness who has size and plays with snarl. Consider Cozens a sort of Podkolzin West — a physical force with a team-first attitude who uses skill and strength to dictate the tempo of a game. Graceful puck mover with an advanced brain who defends as well as any draft-eligible rearguard. The transition for this right-handed shot to the SHL from junior has been seamless. An electrifying winger who plays with controlled violence and jaw-dropping skill. Boldy treats every shift as an opportunity to strike fear into his opponents. Pesky winger with a nonstop motor and the ability to make plays off of board battles and cycles. The puck always seems to find him. A right-handed defenseman, Honka plays cool as a cucumber under the most harrowing of conditions, and his penchant for beating pressure with his wheels makes him perfect for today’s NHL. The younger brother of Habs’ prospect Nick Suzuki is an outstanding set-up man who plays a bit more engaged. Big-bodied goal scorer with very good speed and can stickhandle his way around any jam. Beecher has top-six talent written all over him, but it’s not easy to distinguish oneself on a team loaded down the middle. He’s a powerful skater with excellent agility and does phenomenal work on the penalty kill. Undersized Czech winger who always finds a way to stand out on the top line at multiple international events. He’s the leading teenage scorer in the Czech Republic’s second division. Pure finisher with quickness and elusiveness, Caufield may be listed as only five-foot-seven, but he plays fearless and will take the puck inside with authority. Similar to Alex DeBrincat but not as abrasive. Nussbaumer has the misfortune of playing for an undermanned doormat, so take his stats with a grain of salt. He’s a 200-foot center with a high compete level who can tailor his game to his coach’s needs. A fantastic skater who can play the role of a rover, Constantinou is one of the more graceful teenage defensemen you’ll find for this year’s draft. An artist with the puck, the right-handed defenseman is a big gambler but appears eager to learn and improve his play in his own end. Sniping winger with a lethal shot who as a 17-year-old is one of the OHL’s top scorers. Kaliyev is a high-volume shooter who does a lot of damage off the rush. A poised two-way left-handed defender who loves to carry the puck and take it deep. Robertson is the leader of Edmonton’s defense corps and is the option his teammates turn to when they’re under pressure. Aggressive puck rusher with speed who can whip the puck around with both accuracy and authority. A left-handed defenseman, York is a bit of a risk-taker but he stretches opposing coverage and owns a deadly wrist shot. A towering winger who can serve as a pass-first playmaker or a goal scorer. Donovan has incredibly soft hands and is unpredictable once he takes the puck strong to the net. Another poised right-handed defender from the NTDP, Helleson is a one-man breakout who isn’t shy of contact and can be trusted to cover the low slot when it’s required. Smothering two-way center who can score from just about anywhere in the offensive zone and match up against opposing top lines. Spiridonov also dominates on draws. A rugged winger with soft hands who plays fearless and relentless in all three zones, Dorofeyev is dangerous in odd-man situations and makes good decisions with the puck. Reliable, big-bodied puck moving left-handed defenseman with a cannon for a shot who can be used in either a shutdown role or orchestrate the attack from deep inside his own end. I’m telling you these zone entries, man. Outstanding vision from Alex Vlasic and a sweet tip from the slot by Matthew Boldy. One of the draft’s top one-on-one defenders, Bjornfot is a fluid skater with escapability who can log big minutes. A left-handed shot, his quick release on his wrister helps create rebounds of seemingly harmless attempts. Team USA’s top set-up man at the Ivan Hlinka Tournament, Farinacci can carry the burden of being the go-to guy. The future Harvard Crimson is extremely crafty with the puck but also is reliable in a defensive role. Who is Kirsty Gallacher dating and what football team does the Sky Sports News presenter help?